In what’s dubbed the first integrated health care village in the world and largest health care project in the nation at $1.2 billion, Union Village in Henderson is starting to take shape. Little has been discussed publically about the billion-dollar project since Henderson Hospital, the first element of the 155-acre development opened seven months ago. An ambulatory surgery center and doctor’s office building adjacent to the hospital remains under construction for tenant improvements for opening this year. During a Henderson Chamber of Commerce luncheon at Fiesta Henderson, Craig Johnson, the co-founder of Union Village and head of its strategic planning, said R &O Construction has undertaken $13 million worth of infrastructure work that will pave the way for facility construction that will take place and through 2018. 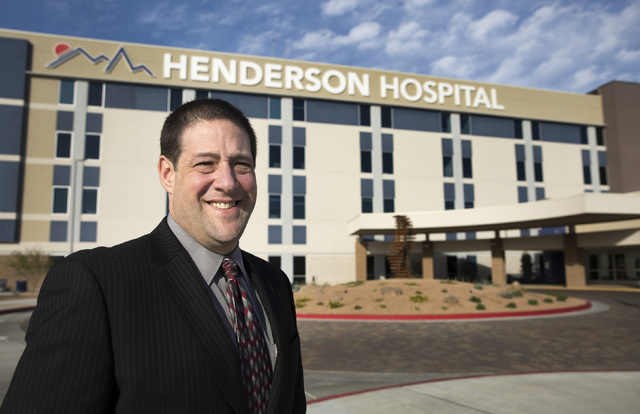 “We’re talking about a landmark project and trend-setting project right here in our community,” Scott Muelrath, president and CEO of the Henderson Chamber of Commerce, told chamber members. Approximately 355,000 square feet have been completed and $300 million in work is done, Johnson said. There are 476,000 square feet under construction worth $64 million and another $277 million that will be under construction by the end of the year, he said. The second phase of infrastructure to be completed by the end of the year has involved grading, building streets and constructing a park, Johnson said. Of the 155 acres, Union Village has closed on 79 acres. That includes 37 acres for the hospital and 10 acres for the Las Vegas Athletic Club whose construction will start in June, Johnson said. Some 17.4 acres has closed for one apartment project and second apartment will be on 14.5 acres, Johnson said. One will be 416 units and the other will be 356 units and open to all age groups. The site has 28 acres in escrow, Johnson said. That includes 3.5 acres for a long-term acute care hospital operated by Kindred Healthcare. Union Village also has a letter of intent for Kindred to build a rehab facility on seven acres, he said. Union Village is involved with a partnership on 4 acres for a 200-unit senior living facility, Johnson said. Plans are moving ahead for a memory care center, 60,000-plus square feet as part of a wellness center that would include Eastern and Western medicine, 50,000-plus square feet of retail uses and two dialysis centers. There’s even a letter of intent for a hotel on 23 acres and skilled nursing facility, he said. Juliet Cos. is serving as broker, and Johnson said with the International Council of Shopping Centers retail conference in Las Vegas, executives visited Union Village in anticipation of finalizing deals. The village as a whole will focus on wellness instead of “typical senior living,” Johnson said. The memory village will be the first of its kind in the U.S. and a “radical departure of how we’re treating people with Alzheimer’s and dementia,” Johnson told chamber members. The Union Village concept calls for 18 to 20 houses of six to seven rooms with a living room, dining room and kitchen. Caregivers will be dressed in jeans and casual wear rather than institutional clothing. There will be a porch and front yard that looks into a village with a restaurant, fitness center, health care clinic, Starbucks, pub, grocery store, theater and club room for activities and arts and crafts. There will be a second story above the village for non-ambulatory residents who need more special care, Johnson said. People who live in Union Village would be able to access all aspects of medical care from the hospital, doctor’s office, skilled nursing, rehab center, and long-term acute care hospital. A patient’s medical records would be accessible throughout the village and doctors would be able to access any data they require for treatment and care, Johnson said. The project will create an environment that will spawn many companies and facilities to be part of it, Johnson said. That’s important because focusing on wellness keeps people out of the hospital, Johnson said. The stay at Union Village may be for a set price no matter if you need assisted living, skilled nursing or memory care, he said. All people would pay would be the annual cost-of-living increases. A room key would serve as a debit card when it comes to eating food in the village, he said.